With time moving faster than ever, or so it seems as we're nearly into the second month of the year already, it's time to start getting our homes ready for the spring and summer - or to put it frankly, the warmer months! When we lived at the flat, we was luckily not on the ground floor, and so didn't have to worry about a back door and ground floor windows, but now we're at the house, it's a whole different ballgame! As for insects, apart from spiders, moths, and the odd bee, we didn't have to worry about ants and all the rest of the creepy crawlies! However, we're now blessed with a house, and a garden of course, so I've put together this post, to help not only myself, but hopefully to help many of us! When I lived at the flat, I didn't have a washing line, or anywhere to put a washing line, so all my clothes drying was done on the radiators, on a airer or in the dryer. Now I have a house, with a garden and a washing line, I take full advantage of saving some electric, but have to be careful of what I'm bringing into the home! Moths are not the only clothes eating insects, carpet beetles love to eat clothes, and their eggs hatch a lot quicker during warmer weather! You should always shake your clothes vigorously to ensure no unwanted insects come inside with you, including fleas which can infest your home in days! With the world we live in, we have to be aware of our surroundings at all times, sadly that also means being cautious in our own homes! No one wants to have all of their windows shut in the warmer weather, and why should we if we're at home occupying it? We can't be in every room at the same time can we? That's why I've purchased window restrictors from Mighton Product to ensure our homes safety that little bit extra! This way, I can have my windows open just enough to let the fresh air in, and to cool the room from the hot summers sun! Expansion is a common problem in household roofs across the country, expansion is when materials expand (they usually contract during the winter/colder months), and that's why it's important to check your roofs every now and again! Many roofing contractors, are able to assess any damage that may have been caused in the winter and often times you can get a free inspection. Winter isn’t the only season that can cause damage to our roof. While sunlight and heat may not cause direct damage themselves, having too little ventilation and insulation in the attic could cause you damage, like mold, never a nice thing to deal with! Over the last few years, I've lost count of how many news reports I've seen on fires being caused by mirrors! The most tiniest of sun beams shining onto your mirror, then bouncing off onto another object can cause a deadly fire. In my hometown, a couples home was ruined, but thankfully not their lives after a mirror set fire to a curtain in the bedroom, all down to the sun! I now cover any mirrors up in the summer, but with sunshine beaming through all year, I've started to close the curtains and blinds too! 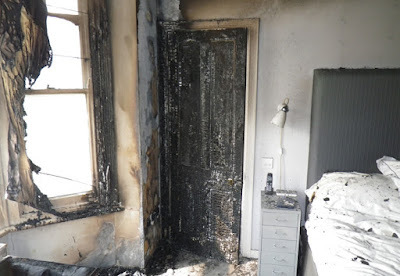 After further research, it's not just mirrors that can cause fires, please do your research and be careful! Last but not least, if like me you're a keen flower lover, remember your plants will need a lot more water during the warmer periods! I stupidly underestimated how much water my flowers needed last year, and sadly lost a few! Buying a watering can was the best thing I done last summer, as it helped me to measure how much water each plant was getting!